Greening of computing processes is an environmental strategy gaining momentum in the 21st century as evidenced by increased virtual communications. Because of the rising cost of fuel to travel to meetings and conferences, corporations are adopting sophisticated technologies that provide a “personal” experience for geographically disbursed colleagues to interact in real time. This article highlights several companies and academic professional organizations that utilize video conferencing, virtual classrooms, and virtual worlds to create digital spaces for collaboration. The article compares the impact of face-to-face collaboration that includes business travel expenses to the impact of the same activity in a virtual space. The human side of technology is also examined through virtual human resource development that increases employees’ learning capacity and performance improvement. As advances in technology continue, it is expected that meetings will become more lifelike with the improvement of holographics. Corporations must continue to integrate green strategies to satisfy both environmental concerns and financial viability. Economic recession and soaring fossil fuel prices have affected the viability of many privately held companies and public and nonprofit organizations. To remain competitive and achieve their goals, organizations are increasingly leveraging sophisticated communication technologies so that individuals and workgroups at a distance can collaborate ( Bingham & Connor, 2010 ). Concomitantly, there is a movement toward more environmentally friendly “ green ” products and processes to increase sustainability ( Witkin, 2011 ). According to Hasbrouck and Woodruff (2008) , the importance of environmental issues has trickled down the supply chain and “permeated the awareness of consumers, regulatory bodies, OEMs, and others over the past few years” (p. 39), bringing with it new ways of conducting business. Further, in a 2008 survey, more than 80% of polled U.S. workers agreed that it was important to work for a company or organization that makes the environment a top priority ( Kauffeld, Malhotra, & Higgins, 2009 ). The purpose of this article is to highlight current trends that organizations use for collaboration and organizational learning that increase their viability and digital footprint. This article will also seek to demonstrate that these virtual communications are a green computing initiative for the sustainability of the environment. The term green computing refers to the “study and practice of using computing resources efficiently” ( Childs, 2008 , p. 1); it is comprised of many facets, including the design, manufacture, use, and disposal of computer hardware and software ( Lo & Qian, 2010 ). For this article, the authors will focus on the efficient use of computing resources for collaboration that reduces travel time and cost, increases organizational efficiency, and addresses environmental concerns. Technology is permeating both professional and personal lives as never before ( McWhorter, 2010 ). Hopper and Rice (2008) discussed the benefit of “digital alternatives to physical activities” (para.7) as a way to reduce the impact of travel and the use of fossil fuels. They offered examples, such as electronic versions of newspapers, music downloads from the Internet, and online shopping. Likewise, collaboration with colleagues can be conducted via digital space. 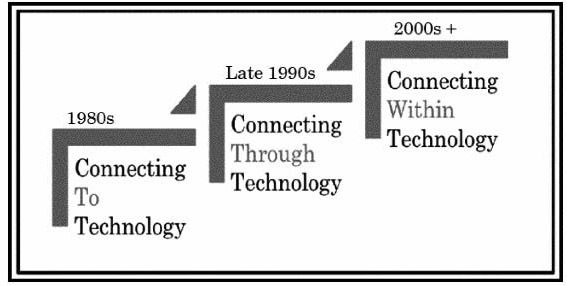 The history of the Internet depicts users who have connected to, through , and within technology ( Kapp & O’Driscoll, 2010 ; McWhorter, 2010 ). Figure 1 depicts these three distinct phases of the evolution of information and communication technology that are conducive for the greening of technology. In the 1990s, PCs became popular and employees and learners began connecting to technology to access useful data. In sharp contrast to earlier generations, the advent of new technologies, such as Web 2.0 tools, moved the user to the next step, connecting through technology to collaborate with others. The technology has now evolved so that it enables users to connect within the technology in immersive meeting spaces. Such environments allow for advanced collaboration and co-creation of user-made organizational content ( Gronstedt, 2008 ) where users establish a virtual co-presence (the feeling of being present in the same digital space). Ted Nelson coined the term virtuality to describe the conceptual nature of an object (see Xanadu.com). Here the term virtuality is used to encompass synchronous (in real time) collaboration of learners and workers at a distance facilitated by integrated computing technologies. These synchronous collaborative “meetups” utilize integrated technologies, such as video conferencing, virtual classrooms, and virtual world platforms, so that colleagues can collaborate with each other although in geographically disbursed locations. In the context of green computing, each of these technologies will be discussed followed by the best practices of virtual collaboration for green computing. The U.S. Travel Association reported that 31% of business travelers used videoconferencing in 2008 to replace at least one business trip ( Bell, 2011 ). Video conferencing utilizes synchronous desktop media, such Skype™, Facetime™, or Yahoo Messenger™, to collaborate via text chat, voice, and video (through built-in or external webcam and microphone). According to Aamoth (2011) , Skype™ was recently acquired by Microsoft, which opens the door to embedding it within Microsoft’s many software applications. For higher end video conferencing, companies can invest in a life-sized high-definition (HD) system, such as Cisco’s TelePresence™, to conduct business with others at a distance ( Kozubek, 2010 ) for truly “you are there” (p. 36) telepresence (technologies that make individuals feel they are meeting in the same space). This technology can connect team members face to face in virtual meetings transmitting full HD video to up to 48 locations globally. Viewing participants in HD appears to break down cultural barriers because participants can view common material on their computer screens and can see facial expressions and gestures. Green computing also encompasses new trends in video conferencing, such as increased integration and portability. Smaller devices, such as smartphones (e.g., the iPhone™ and Blackberry Storm™) and digital tablets (e.g., the iPad ™ and HP TouchPad™) ( Hiner, 2011 ) can be loaded with video conferencing software that requires smaller electrical loads. Such portable devices with video conferencing capabilities facilitate student learning, employee training, project management, and the broadcasting of organizational events ( Toperczer, 2011 ). A useful virtual classroom environment is formed by integrating voice over Internet Protocol (VoIP), a webcam, text chat capability, and the ability to share applications, such as a virtual whiteboard. In this digital space, users can collaborate in real time through Internet technologies. An example of a virtual classroom environment is the Elluminate Live! 10 platform ® that can be either a stand-alone product or one embedded into an organization’s learning management system. This platform combines an interactive whiteboard, breakout rooms, two-way audio, multipoint video, desktop and application sharing, rich media, and session recording capabilities (Elluminate.com, 2011). See Figure 2 for a screenshot illustrating a virtual team meeting among three geographically disbursed colleagues. A virtual world has been defined as “a synchronous, persistent network of people, represented as avatars, facilitated by networked computers” ( Bell, 2008 , p. 2). According to KZero Worldwide (2011) , approximately 42 million registered users (aged 25 and up) take part in various virtual worlds. These 3D virtual worlds are used for both entertainment and professional activities, including training and development ( Chapman & Stone, 2010 ). A recent study into the media-rich interactive environment of Second Life™ found it conducive for adult learning endeavors ( Mancuso, Chlup, & McWhorter, 2010 ). Highly effective for simulations and collaboration, these green virtual spaces provide real-time opportunities for virtual teams and events ( Bingham & Conner, 2010 ; Raisor & McWhorter, 2011 ). As a case study, Fazarro, McWhorter, and Lawrence (2011) described how nanotechnology safety training could be taught effectively in such an environment. Through avatars (graphic representations), users can interact with one another using local text chat, voice chat, and instant messaging via user-user or user-groups. 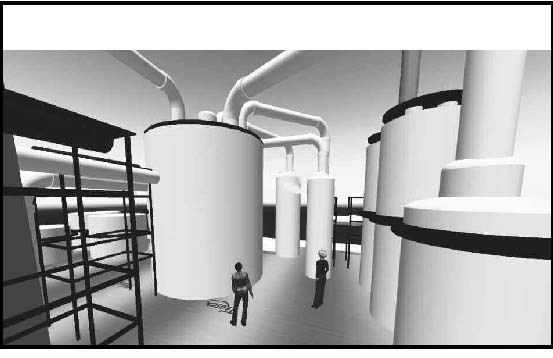 Figure 3 depicts collaboration between two colleagues as they examine a 3D model of a Sulfuric Acid Plant; this exemplifies the meeting within ( McWhorter, 2010 ) context of technology, and it saves organizations time and money and is beneficial to the environment because fossil fuels are not expended for unnecessary travel. A relatively new trend that buttresses the green computing concept is the addition of a virtual component to professional conferences. A number of professional organizations are now adding this option for members who cannot travel because of time or financial constraints. For a reduced conference cost, members can view the Keynote Address, a number of top presentations, and more. One example of a conference with a virtual component is the IEEE Nano Council’s Nano 2011 Conference in Portland, Oregon. If unable to attend, a member could participate in the post conference, including the conference program, full proceedings on a USB flash drive, and online access to narrated slides, which the organization noted would be “saving travel, hotel and meal expenses” ( IEEE Nano 2011 ¶3). A sample of other national conferences that offer a virtual or online component includes The Society for Human Resource Management, the American Society for Training and Development, the American Library Association, and the National Board for Professional Teaching Standards. 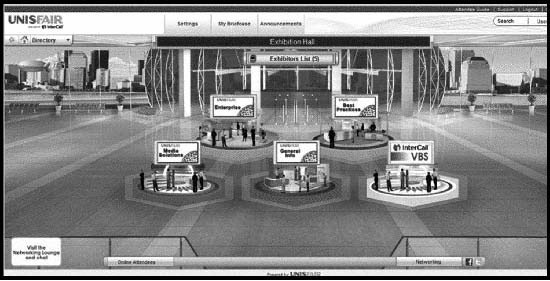 Figure 4 depicts a virtual meeting area where attendees can examine an online exhibitor hall that includes information about various products and services. According to Bell (2011) , virtual conferences are becoming more numerous. Some organizations offer a virtual conference component to their face-to-face (F2F) annual or semiannual conference; however, some organizations are opting for the virtual-only conference, a true green computing initiative that benefits the environment and increases their viability. Data has not been collected on either the number of individuals who attend virtual conferences or their feedback on the experience. However, a clue to market growth can be seen in the number of companies who offer support and services for virtual conferences. For instance, a recent search for virtual conference vendors revealed 40 companies that offered these services to organizations ( Bell, 2011 ). When contemplating a virtual conference as a hybrid component to a F2F conference or as a stand-alone event, organizations must consider the advantages and disadvantages afforded by each venue. Table 1 examines several dimensions, such as cost, convenience, and participation when comparing a F2F conference to a virtual conference. Be mindful of the appropriateness of using virtual communications instead of F2F (need to know when and how to use it). Determine the extent of executive and managerial buy-in using virtual technologies. Establish goals and outcomes for using virtual communication. Establish rules of engagement (protocols) with stakeholders. 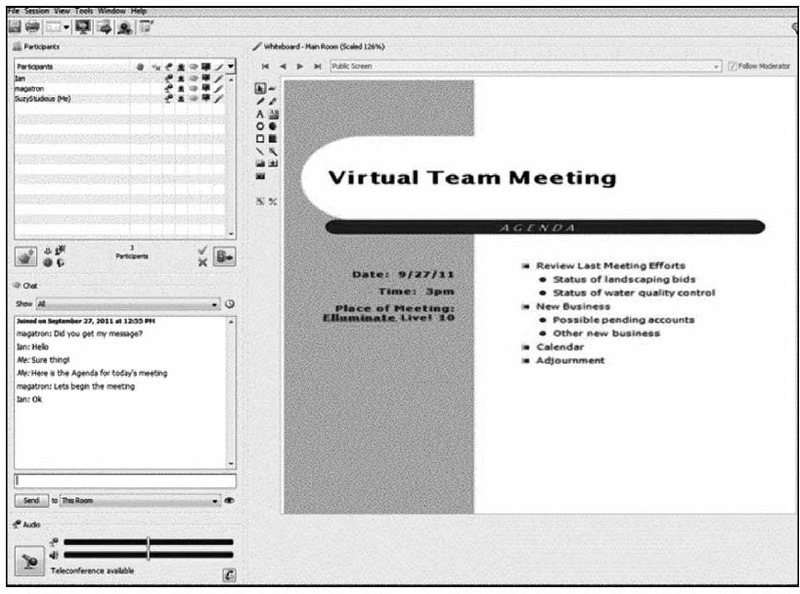 In addition, Soule and Applegate (2009) established best practices for successful virtual project teams through virtual communications that included leaders adapting to technology. This is particularly important when organizations move from F2F meetings to virtual technologies. Also, it is imperative that organizations spend adequate time and resources before they expect that members or employees will be effective with the new technology. Along with the greening of their collaborative efforts, organizations must enact virtual human resource development (VHRD) efforts to develop individuals’ virtual technology literacy. VHRD is “the process of utilizing technologically integrative environments for increasing learning capacity and optimizing individual, group, community, work process, and organizational system performance” ( McWhorter, 2011 , p. 3). These identified best practices are a sample of those that contribute to effective virtual communication. As technology improves, people must adapt and effectively use various technology-enabled collaborative techniques to maintain viability in the global marketplace and sustainability for the environment. The financial and environmental impact of using green computing will be discussed next. According to LaBrosse, (2010) : “The explosion of concern about the environment and the emerging business imperative for companies of all sizes to become sustainable presents a challenge for all managers” (p. 87). When introducing green computing within organizations, managers/leaders must first examine the cost benefits of the technology over the long term. The impact of face-to-face collaboration involving geographically disbursed individuals and groups is costly from both the financial and environmental standpoints. For example, conventional travel to conferences requires using ground transportation, aircraft, or both, and these involve expensive fossil fuels and provide a massive output of CO2 (thought by a number of researchers in the scientific community to be very dangerous for the environment, and its impact is being investigated in many studies). It is estimated that the average passenger automobile, for example, produces 8.8 kg of CO2 per gallon of gasoline with an average fuel efficacy of 20.3 miles per gallon ( Environmental Protection Agency, 2005 ). Aircraft CO2 production varies by flight distance, and it is between .279 kg of CO2 per mile to .187 kg of CO2 per mile, depending on the length of the flight ( Environmental Protection Agency, 2008 ). By comparison, videoconferencing makes use of equipment already available in the office, with the possible addition of a webcam. The savings made by decreasing travel for meetings that can be reasonably accommodated through modern technology have benefits that far outweigh any possible increase in energy used during videoconferencing. In the 21st century, videoconferencing is an important activity of many businesses and organizations. One example of cost savings through videoconferencing follows. Ira Wainstein, partner and senior analyst of Wainhouse Research, focused on quality and speed of decision making and the development of more effective work teams and lower operation costs ( Kozubek, 2011 ). Verizon Business™ (2011) designs videoconferencing technology to enhance the productivity of business meetings. Illustrated in Table 2, Verizon Business developed a cost comparison of four people attending a business meeting versus this meeting held via videoconferencing. Corporations are facing uncertainty about the economy and the environment; however, companies are creating out-of-the-box approaches for viability and sustainability. Corporations that practice continuous improvement will provide new and innovative ways for cost and environmental savings both now and in the future ( De Geus, 2002 ). Thus, ideas about the future of green computing will be discussed next. It can be speculated that in the year 2020, through the advancement of nanotechnology, processing speeds for computers will be tenfold compared to speeds in 2012. Also, the commitment to green communication will likely be commonplace for corporations that conduct business globally. In the future, advanced technology for conducting meetings may consist of full-scale virtual people to assist virtual communications. Figure 5 illustrates graphical interfaces for such collaboration in real time during the next decade. In fact, this depiction may be the optimal approach for virtual communication. For example, a CEO or an executive can conduct formal meetings using 3D high-definition holographic/virtual-world technology that projects an image of a person from any place on the planet to a place at the table. Furthermore, with sensors embedded in the holographic image, the image will have the tactile abilities that allow colleagues to shake the holographic hand of the person at the other worksite or event. For example, a full-scale holodeck might be used for a person to travel to London to attend a meeting without leaving the office. This technology has been researched for years with the concept derived from the science fiction show, Star Trek: The Next Generation ( Grover, 2006 ). This depiction may seem like science fiction, but with greater flexibility and capabilities formed through technology, virtual communications will likely become the main mode of conducting business. It is expected that the way people conduct business will likely be radically different during the next decade as they use increasingly sophisticated technologies. The green technology movement is burgeoning as organizations are taking responsibility for the environment and embracing more efficient technology-enabled resources ( Williams, 2007 ). This article has highlighted examples of cost savings and increased efficiency through the utilization of videoconferencing, virtual classrooms, virtual worlds, and virtual professional conferences. In addition, best practices for using sophisticated virtual technologies and future trends have been offered. These virtual initiatives provide a context for saving organizations time and money; they also benefit the environment by discontinuing unnecessary travel. Organizations need to be cognizant of ways to achieve optimal savings regarding both financial and environmental impact and become savvy as they leverage technology in meaningful ways. Organizations should consider additional outcomes, such as recruiting new members through virtual conferences as these provide increased access to a global market. Green computing allows for greater connectivity and customer service through efficiency of use. In the current lean status of organizations, technology should be considered for increasing membership, forming collaborative partnerships to share resources, and offering professional development. In addition, organizations should help their leaders and members to become more technologically astute. The authors wish to acknowledge Curtis Felder for his research assistance during the development of this article. Dr. Dominick Fazarro is an Associate Professor of Industrial Technology and Industrial Management at The University of Texas at Tyler. He is a Member-at-large of Epsilon Pi Tau. Dr. Rochell McWhorter is an Assistant Professor of Human Resource Development at The University of Texas at Tyler, and is a member of the Delta Gamma Chapter of Epsilon Pi Tau. 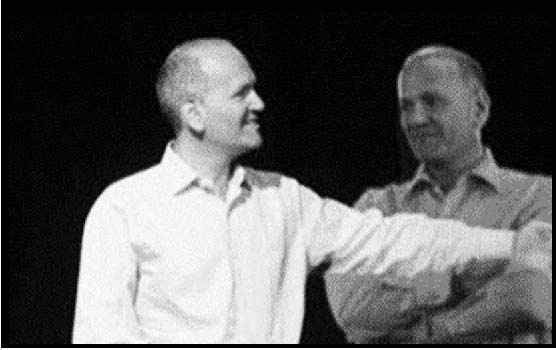 Bingham, T., & Conner, M. (2010). The new social learning: A guide to transforming organizations through social media . Alexandria, VA: ASTD Press. Childs, S. (2008). Editorial: Green computing. Health Information on the Internet, 62 (1), 1-2. De Geus, A. (2002). The living company: Habits for survival in a turbulent business environment . Boston, MA: Harvard Business School Publishing. Fazarro, D. E., McWhorter, R. R., & Lawrence, H. (2011). Going virtual: Delivering nanotechnology safety education on the web. Journal of sTEm Teacher Education, 48 (2). Gronstedt, A. (2008). Training in virtual worlds. Infoline, 25 (803), 1-16. Grover, S. (2006). Holding class on the holodeck: experimental learning through technology. Perspective, 6 (2), 40-51. Hasbrouck, J., & Woodruff, A. (2008). Green homeowners as lead adopters: Sustainable living and green computing. Intel Technology Journal, 12 (1), 39-48. Kapp, K. M., & O’Driscoll, T. (2010). Learning in 3D: Adding a new dimension to enterprise learning and collaboration . San Francisco, CA: Pfieffer. Mancuso, D. S., Chlup, D. T., & McWhorter, R. R. (2010). A study of adult learning in a virtual environment. Advances in Developing Human Resource Development, 12 (6), 691-699. McWhorter, R. R. (2011). Scenario planning as the development of leadership capability and capacity; and virtual human resource development (Doctoral dissertation). College Station, TX: Texas A&M University. Raisor, C., & McWhorter, R. (2011). Using virtual world technology to facilitate technical communication instruction. Innovative Research in Virtual Worlds 2011 Conference , Coventry University, Puma Way, Coventry, UK. Räsänen, M., Moberg ,_, Picha, M., & Borggren, C. (2010). Meeting at a distance: Experiences of media companies in Sweden. Technology in Society, 32 , 264-273. Roberts, P. R., & McWhorter, R. R. (2011). Virtual conferences as virtual human resource development . Unpublished manuscript.